We may have gotten all our Halloween decorations up by October 2nd, but Halloween is still three weeks away, which means there’s plenty of time to get your home in the holiday spirit. While there are certainly impressive current day Halloween decorations, there’s a certain charm to vintage decorations that just can’t be beat, so we looked into the history of Halloween decorations a bit. Prior to the 1930s, Halloween was primarily a holiday celebrated by adults. Because of this older decorations tend to be more scary and unsettling, since it was meant to catch your eye at a party and spook you. Once trick-or-treating was introduced in the mid-1930s Halloween gradually became geared more towards children, and the decorations became a bit more friendly and cutesy. By the 1950s Halloween had completed its transformation into a children’s holiday. In 1958, Mamie Eisenhower decorated the White House for Halloween for the first time, giving the national seal of approval to Halloween decorations. One company that became closely associated with Halloween decorations is the Beistle Company. If an image of a vintage Halloween decoration comes into your mind, it’s likely a Beistle. Here are some of our favorite vintage Halloween decorations we found across the internet. 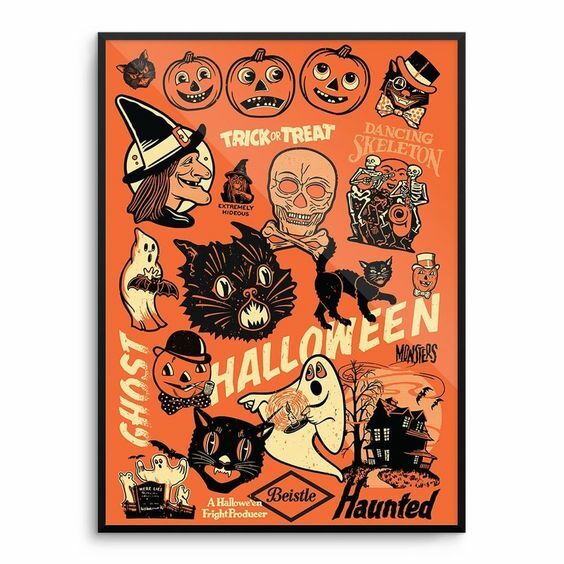 Original vintage Halloween decorations can be rather pricey to buy yourself, but if you want that vintage look Beistle has started selling some of their originals as modern reproductions as an affordable alternative. Thrift shops and garage sales are also a great resource for vintage decorations.